They’re here! 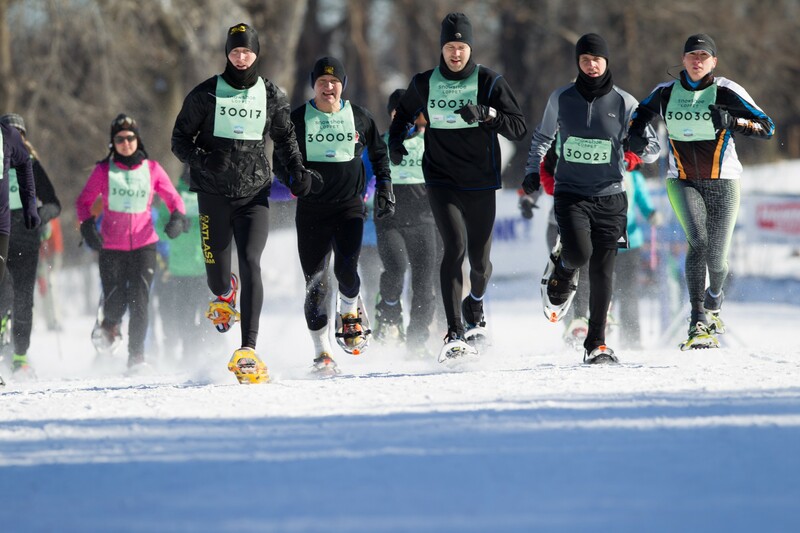 Snowshoes invading the cross-country ski world of the City of Lakes Loppet Festival created a new event, a Sunday race so snowshoers who have the moxie race Saturday and Sunday for a double-up. 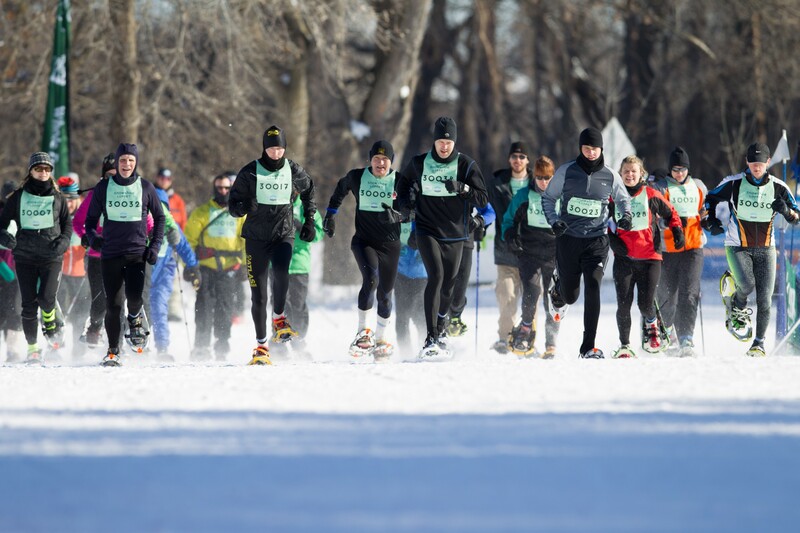 Just perfect for gathering those points for one of the country’s largest snowshoe series, the Braveheart, formed right in the Twin Cities. The Braveheart Race Director Jim McDonell raced the event NOT wearing his Braveheart outfit; unusual! It was hard to recognize him though he zipped a normal quick race by finishing in the top five. 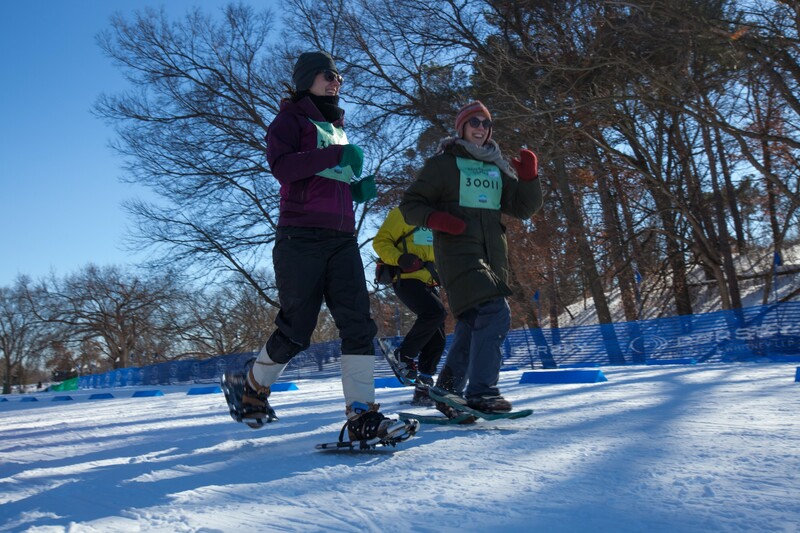 St Paul’s famously fast and highly experienced snowshoer, Kelly Mortenson, won the event in 45:46, out-distancing the ever fleet Ryan Albu, who captured the overall silver, by five minutes. Josh Jorde colored the snow bronze with his 53:22. 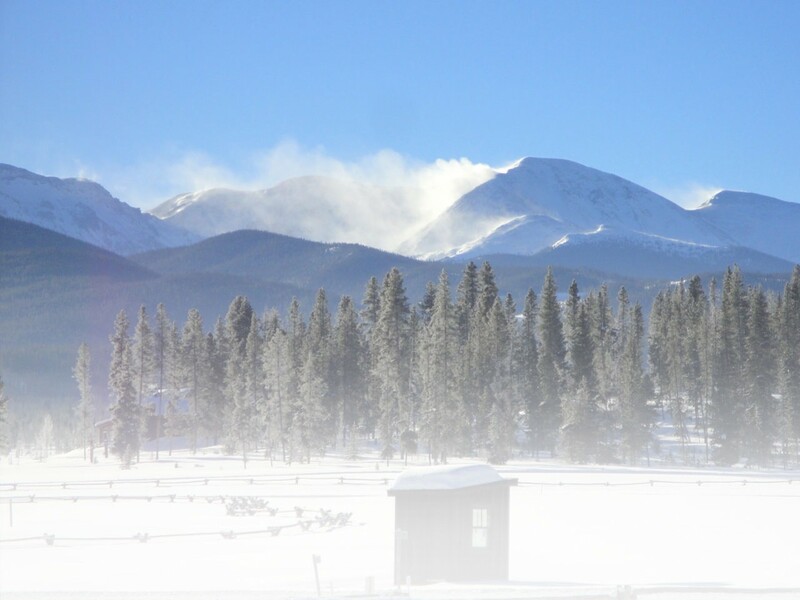 Albu alerted me to a bandit in the group (I’ve identified a photo showing her but awaiting permission), a very attractive one unlike the lead character in the Gnarly Bandit Ultra Trail Series Events.. She “finished third,” Albu said,but as a non-registered racer, her time doesn’t get counted. “She was 100 meters behind me the whole way. I talked to her after, and she said she tried to register day of race, but they didn’t offer it. So she ran anyway.” Note: in 2015, register before race day. The women’s gold and fourth overall fell to the 55:44 of Pam Nielsen. Nielsen led Regina Horak who followed Jesse Daun across the line; Daun captured the last spot under a one hour finish. Bronze for the women went to Keri Baker. 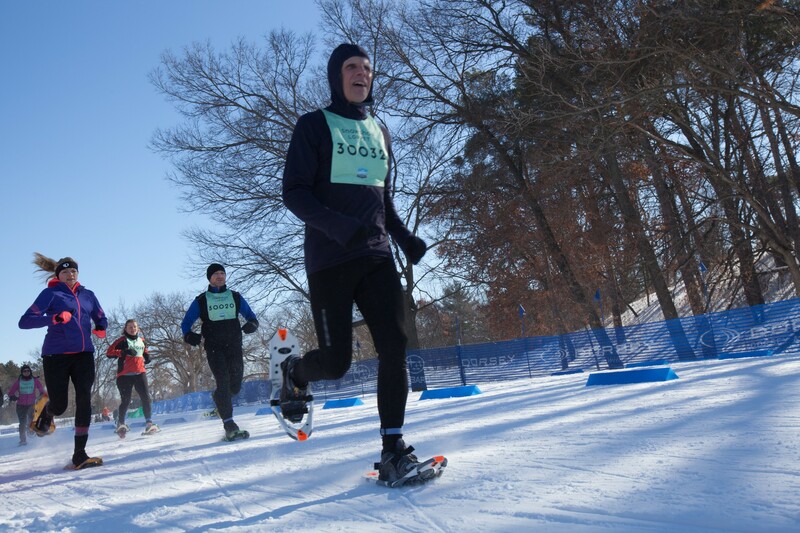 Between Horak and Baker came the dean of snowshoeing in Minnesota, Jim Graupner, with another of his top ten finishes. The top ten crown found Mark Gregware claiming the last spot in 1:08. Other notables found three pushing across in 4:49: Margot Zweber led the way then, five seconds later, Michelle Vanden Plas tied with Anthony Munkhom as they chose to cross together. Abbey Engebretson, Greg Schultz and Annemarie Peterson had a trio finish though the clock ranked them in this order. women’s class, Jeanne LaBore, capturing the only medal in her age class. 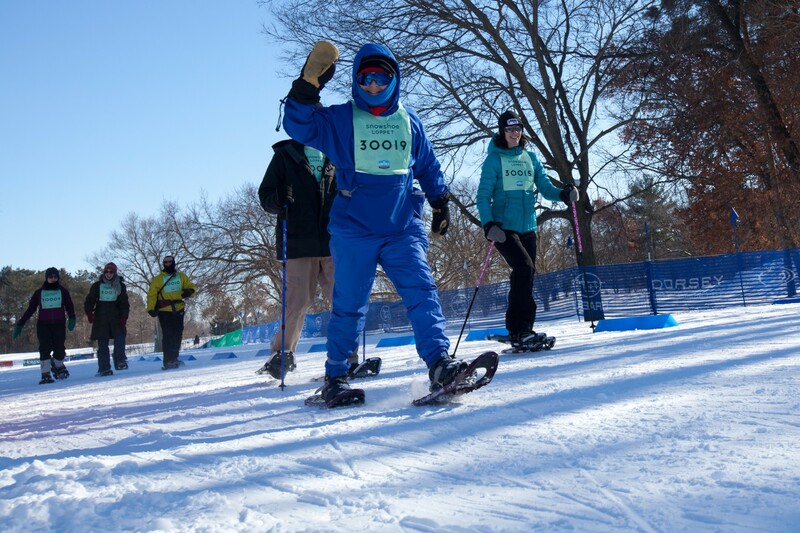 This entry was posted in Features, Homepage Featured, Snowshoe Racing and tagged Albu, Braveheart snowshoe series, City of Lakes Loppet, Loppet, Minneapolis by Phillip Gary Smith. Bookmark the permalink.